Dr. Hudgins was born and raised in Wyandotte, MI, a suburb of Detroit. His interest in space and Astronomy was sparked at an early age, sitting with his grandmother on clear summer evenings while she pointed out constellations. By his teens, Doug was building his own telescopes and dragging his father all over the Midwest looking for dark skies under which to use them. These experiences fueled the life-long love of Astronomy and the night sky. Doug attended Adrian College in Adrian, MI, where he majored in Chemistry and Physics. In 1986, he moved to Cornell University in Ithaca, NY, where he earned a Ph.D. in Physical Chemistry with a minor in Astrophysics. After finishing his graduate studies in 1991, Doug joined the Astrochemistry Laboratory at NASA Ames Research Center where he took up an NRC postdoctoral position working with Dr. Lou Allamandola -a position that allowed him to apply his advanced training in experimental physical chemistry to explore and understand the chemical processes at work in the universe around us. 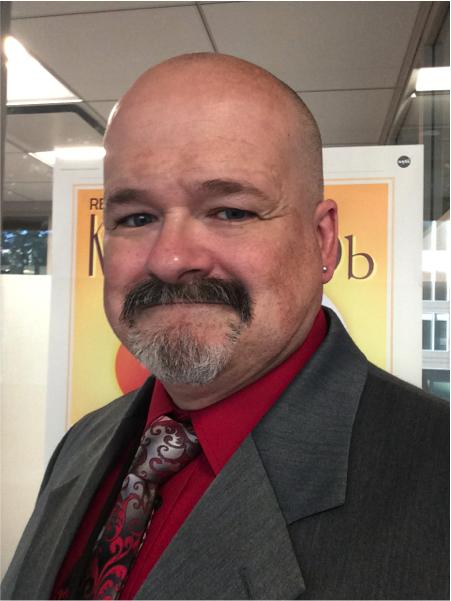 Doug accepted an assistant professor position in the Chemistry Department at his alma mater, Adrian College, in 1994, but returned to the Astrochemistry Laboratory when he was hired by NASA Ames in 1997. As a researcher at NASA Ames, Dr. Hudgins initiated and led an experimental program to systematically measure the infrared spectra of a wide variety of complex organic molecules known as polycyclic aromatic hydrocarbons, or PAHs for short (because even HE doesn’t like to have to say “polycyclic aromatic hydrocarbons” very often!). Over a period of nearly 15 years, working in collaboration with computational chemists, and theoretical and observational astrophysicists, this research program firmly established that PAHs are both abundant and widespread in space. 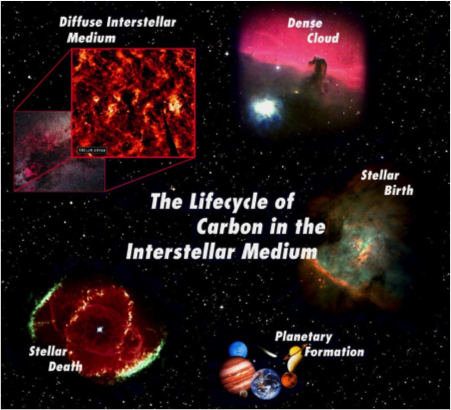 Moreover, the extensive spectroscopic database generated under this research program is today being used by astronomers around the world as a tool to probe the chemical and physical properties of matter at all stages in the lifecycle of cosmic carbon. In 2005, Dr. Hudgins moved to NASA Headquarters where he took up a Program Scientist position in the Astrophysics Division (ApD). He currently serves as the Program Scientist for NASA’s Exoplanet Exploration Program (ExEP) and TESS mission, Deputy Program Scientist for the Kepler mission, and Program Officer for the Astrophysics Data Analysis Program (ADAP), ApD’s flagship research and analysis (R&A) grants program. As ExEP Program Scientist, he is the chief architect responsible for charting the scientific course of NASA’s effort to search out and study planets that orbit stars other than our own sun. His duties in this capacity include overseeing the development of advanced technologies that will one day enable space missions to achieve the Program’s ultimate goal—finding and characterizing potentially habitable, Earth-sized planets around nearby stars, and searching for signs of life on those worlds. Doug lives in Northern Virginia with his wife and family, which includes a variable array of young adult children and a menagerie of pets. Outside of his professional interest in astronomy and astrophysics, Doug remains an avid amateur astronomer and telescope maker. His telescopes include a 24” f/5 Newtonian (home built) and a Meade 7” f/15 Maksutov Cassegrain.